June 22 was the 52nd birthday of actor, writer, director, and all-around B-movie horror icon Bruce Campbell. Campbell was the star of the steampunk western comedy/action TV series The Adventures of Brisco County Jr., played Autolycus the king of thieves on Hercules: The Legendary Journeys and Xena: Warrior Princess, but he’ll forever be known as Ash from iconic horror movies The Evil Dead, Evil Dead 2, and Army of Darkness. 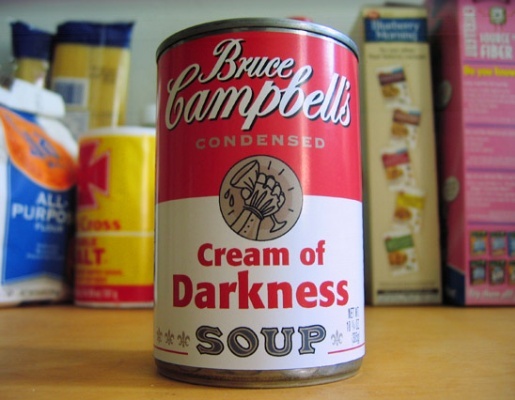 To celebrate the man’s birthday, Sci-Fi Wire put together some incredible homage Bruce Campbell’s Soup labels for the birthday boy. The labels, of course, are parodying the iconic Campbell’s Soup labels, kind of like a low-budget take on Andy Warhol’s modern art masterpieces. You can even print out your very own copy of the four labels they put together! Pretty cool, huh? Bruce Campell’s Soup is mmm-mmm groovy! Hail to the chef, baby!